The Rachel Maddow Show aired a segment about the new polling on Wednesday. Who is your legislator listening to on gun policy? aligned with the NRA than their own constituents. The full set of results is available as a pdf and was meant for use as a full-page newspaper ad. If you were hoping for a more shareable image file, they have this tiny-but-still-readable jpg version. 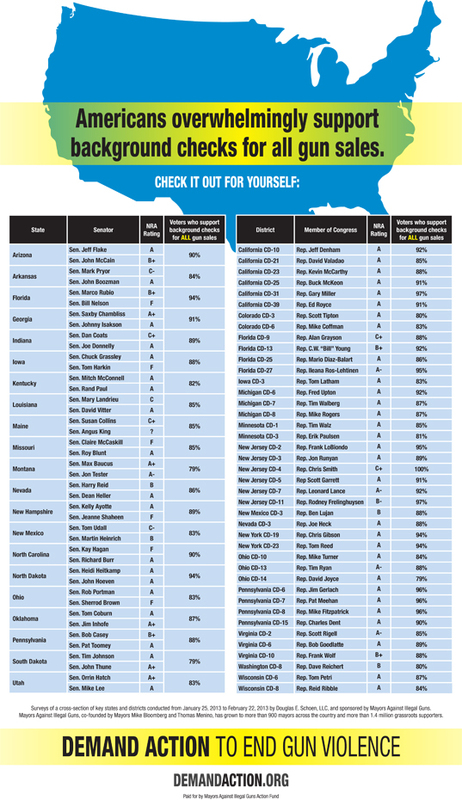 They've also got all of the results broken down by the states and districts they polled. Arizona was a state poll. Even in a state where gun worshipers and fetishists dominate our state legislature, 90% of Arizonans support universal background checks for all gun sales. Next articleSo this Flake has no problem with straw purchase gun trafficking?